Children's Multi-Vite, 60 chewable tablets each (Nature's Wonderland) - Penn Herb Co. Ltd.
Bridge the nutritional gap with our premium Children’s Multi-Vite formula. The naturally fruit-flavored chewable multivitamins provide essential nutrients for healthy brain development, bone growth and immune system function. Give Your Growing Child The Nutritional Advantage! 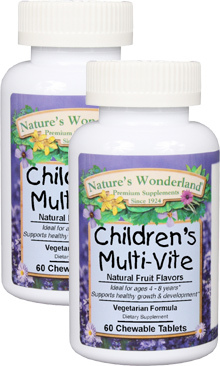 Children's multivitamin and minerals support healthy growth and development. Xylitol-Sweetened. No fructose, corn syrup or added sugars. For children 4-8 years of age: Chew 2 tablets daily with breakfast. Dosage may be increased as directed by a healthcare practitioner.